It’s a sad state of affairs with foundational SEO is ignored, by SEOs! One of the first things I tell my clients is that you HAVE to have well-written, targeted, unique, and properly optimized meta tags. Your page’s title and description tags are your first impression on your potential visitors. The title should be a complete thought accomplished in a specific number of characters. It’s your first chance to attract attention. The second most important tag is the often ignored meta description tag. This tag, when properly formatted, controls the text that is displayed below your blue link in the search engines. If it’s not properly formatted, Google will grab text from your page and display it. You’d better pay attention to it!! This is your best chance (aside from ranking) to attract a visitor. 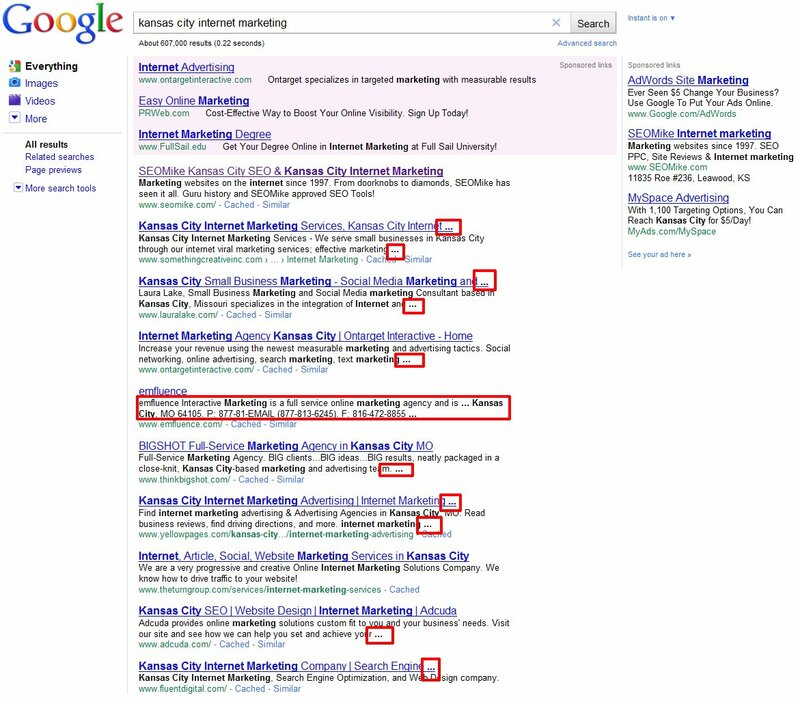 Check out the screenshot below that highlights all the deficiencies of my competitors in the search results for “kansas city internet marketing.” Come on guys… you’re supposed to be pros! The worst offending result is emfluence – the description tag they wrote in their HTML is so long that Google ignored it and grabbed some text from their page. Their title tag is just their company name. Luckily Google pulled some text that includes “interactive marketing” because otherwise their listing is completely ineffective. Check out their title tag – it’s ONE word and that word is their name! The title tag is a super important to the ranking and relevance of a website and they’ve completely ignored it. I hear good things about emfluence, and they have some serious money, but they’ve really missed the boat here. 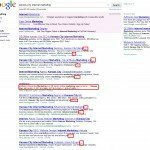 If you’re going to contract an SEO for your company, you should check out their site in the results. Do they rank well? Is their result crafted well? If not, how can you be sure they’ll be able to help you? I can’t speak for everyone, but our meta description is purposely left blank on our home page due to the multiple keyword opportunities. As you said, this allows the engines to pull the most relevant content, and since that specific page is so generalized, encompassing a variety of services, we believe this is preferable to attempting a 160 character summary of our entire business. I think there are many other ways that you can optimize your site for multiple keywords, both on page and off. I think it’s best to craft a description tag for your homepage that encompasses everything your company does. Leaving you description tag blank lets Google decide how to present your company to your potential customers. Google presents what they believe is relevant and often does not present a complete thought. It’s part of your first impression – you should own it. You’re absolutely right. I have to admit that I’m an offender myself. How does it go, “The cobbler’s kid has no shoes”? At least none of my titles and descriptions are too long (perhaps missing, but not too long). That is a pet peeve of mine as well.